And we'll send it directly to them, every bag fresh roasted and custom blended. Each gift coffee is a Standard Sparkplug sized bag (300g - makes about 30 cups of coffee) and includes standard shipping anywhere in Canada. Note: We ship coffee every Tuesday - your gift will get sent next Tuesday and, if you're giving 2 or more bags, every 4 weeks thereafter until the gift order is fulfilled. We’ll send the 1st bag within a few days and then a bag every 4 weeks until the gift is complete. We'll include a note with every shipment letting them know it's a gift from you. If you have a special gift message, mention it in the comments box during checkout. We'll email you every time a bag of coffee is mailed out so you know it's taken care of. Our coffee gifts send a Standard (300g) bag of coffee. That's how much we can squeeze into a Canada Post lettermail envelope. This size is designed to make about 30 great mugs of coffees. CAN THE GIFT BE CHANGED? You or your recipient can change the coffee blend, grind or even how often we send their gift. No problem! Just email or call us with the request and we're happy to make those changes. No changes to the bag size or number of bags, though! Can I Give Something Else? Sure! Pick anything on our website and, during the Checkout, let us know the name and address you'd like it sent to. There's a spot to leave Comments, in case there's any special instructions, too. Check out our Gear page for great swag and coffee making gift ideas. All of our coffees sound good? Not sure what they like? 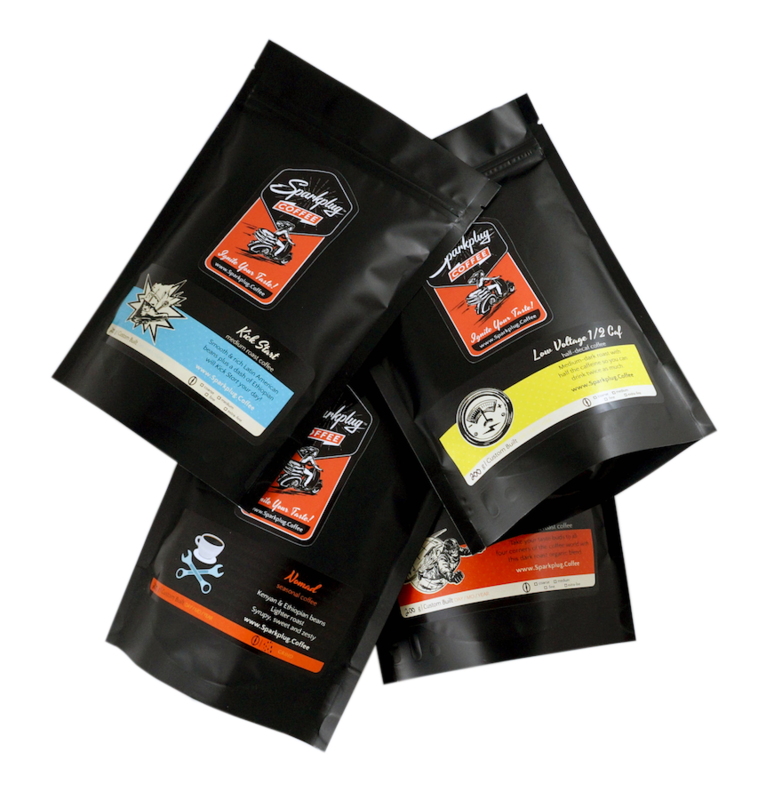 Get them one of our 4-coffee samplers that deliver 200g bags of 3 signature blends (the Classics or the Super Customs) plus the current seasonal coffee. We use Canada Post. If your friend has a postal code, we'll get it to them. FREE Standard shipping with Canada Post is included in our coffee prices. And there's no tax on coffee so no costly surprises when you get to the Checkout! Tracked shipping available at the checkout for a small fee. Note that this is a one-time additional fee which we'll use for the first (and most important!) of your gift shipments. We love doing custom orders and can create a special coffee blend and/or packaging to fit the occasion. Whether it is just one bag with a special label or 100 gift packs for your party guests, we can work something out that meets your budget and wows the recipients. Just give us a call (647-479-2897) or email Sparky [at] Sparkplug.Coffee and we'll be happy to work out a special arrangement for you.